A new month is upon us already, and with it we bring to you a selection of new and exciting publications on aspects of social policy and social protection in Latin America and in Brazil, as well as updates regarding the IPC-IG’s work. We are also glad to present you the 2016 Activity Report, which provides an overview of the main activities and achievements of the Centre over the past year. 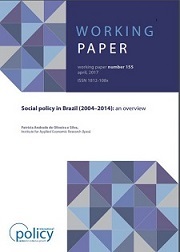 In the Working Paper "An overview of social policy in Brazil (2004-2014)", Patricia Andrade de Oliveira e Silva (Institute for Applied Economic Research—Ipea), presents a comprehensive analysis of the period, a decade that saw a reduction in extreme poverty in the country of almost 68 per cent. This publication is available in English, and an associated One Pager is also available in English and in Portuguese. The One Pager “Social protection and the financial inclusion of rural women in family farming in Latin America” is authored by Bettina Gatt (Gender Consultant in the Regional Office for Latin America and the Caribbean, Food and Agriculture Organization of the United Nations—FAO). It summarises the main points of discussion of the eponymous webinar, which explored the potential of social protection to contribute to the empowerment of rural women, focusing on financial inclusion programmes in Latin America. 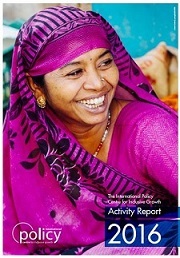 Held in November, this webinar was the fourth of the series titled “Gender-Sensitive Social Protection", a joint initiative by the IPC-IG and FAO and hosted by the online platform socialprotection.org. The publication is available in English, Portuguese and Spanish. We are proud to present you the IPC-IG 2016 Activity Report, which details our main activities, projects and achievements over the past year. The rationale behind this report is for the Centre to be accountable for its work to stakeholders, partners, donors and society in general, providing information on all the projects conducted in 2016. It is available for download in PDF in English, as well as in smartphone/tablet-friendly formats. The One Pager “How to Move beyond the Impact Evaluation Trap? Setting up Comprehensive M&E Systems for Social Protection Programmes”, by Ramlatu Attah, Valentina Barca, Ian MacAuslan, Luca Pellerano (Oxford Policy Management—OPM), Luigi Peter Ragno (UNICEF Ghana), Nils Riemenschneider (OPM), and Claire Simon (Independent consultant) is now available in French. The One Pager “Evaluation of the Kenya Hunger Safety Net Programme Pilot Phase”, by Fred Merttens (OPM), is also now available in French. This study was previously released in English and Portuguese. “The effects of conditionality monitoring on educational outcomes: evidence from the Bolsa Família Programme”, penned by Luis Henrique Paiva (Brazilian Ministry of Planning, former National Secretary of the Bolsa Família programme—2012–2015), Fabio Veras (IPC-IG), Flavio Cireno (Ministry of Social Development and Fight Against Hunger—MDS), Iara Viana (MDS), and Ana Clara Duran (University of Illinois), is now avalible in Spanish. It was previously available in English, French, and Portuguese. Social protection and rural poverty in the NENA region. The IPC-IG joined FAO's technical meeting on social protection, held in Beirut, Lebanon, on 29 and 30 March. 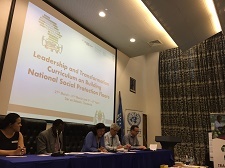 The event aimed to promote social protection as a tool for rural poverty reduction and resilience in the North East and North Africa (NENA) Region. Our Senior Research Coordinator, Fábio Veras, delivered a presentation on the potential synergies and gains from combining agricultural and social protection interventions. Pan-Amazonian Seminar on Social Protection. The IPC-IG participated in the Pan-Amazonian Seminar on Social Protection, which gathered representatives from all nine countries of the Amazon region: Brazil, Bolivia, Colombia, Ecuador, French Guiana, Peru, Republic of Guyana, Suriname and Venezuela. The event was held in Belém, capital of the Brazilian northern state of Pará. IPC-IG research associate and Ipea researcher Fernando Gaiger delivered a presentation about the poverty profile in the Amazon region. He is one of the authors of a study on the same subject, previously published by the Centre, the International Fund for Agricultural Development (IFAD) and Ipea in 2016, titled "Poverty profile: the rural North and Northeast of Brazil". The seminar was organised by the Brazilian Ministry of Social and Agrarian Development (MDSA), in partnership with the World Bank and UNESCO, with the support of the German Society for International Cooperation (GIZ), the Brazil Learning Initiative for a World without Poverty (WWP), the Brazilian Navy, the Secretariat for Social Assistance, Labour, Employment and Income of the State of Pará and the Municipalities of Belém, Barcarena and Acará. IPC-IG Senior Project Officer Mariana Balboni participated in a workshop training aimed at strengthening the technical capacity of the operational and administrative processes in the governance and administration of social protection policies and programmes, held in Dar es Salaam, Tanzania, from 27 March to 5 April. The workshop was organized by the International Labour Organization (ILO), in collaboration with the United Nations Children’s Fund (UNICEF), the United Nations Development Programme (UNDP) and the Government of Tanzania, with the support of Irish Aid and the EU Social Protection Systems Programme (EU-SPS). The socialprotection.org online platform recently announced the launch of its Blog feature, with a series of articles on social protection and health, sponsored by GIZ within the EU-SPS. The Blog posts will be organised under three distinct series: Webinar Series; the Ambassadors Series; and the Sponsored Series. The platform will host the webinar “Chile’s Inter-sectoral Social Protection System and its Familia Programme”, on 20 April. More information here.